The ‘little streets’ in Wolverton – Ledsam Street, Glyn Square, Young Street and Creed Street were built by the London and North Western Railway Company between 1840 and 1846 to house its workers. 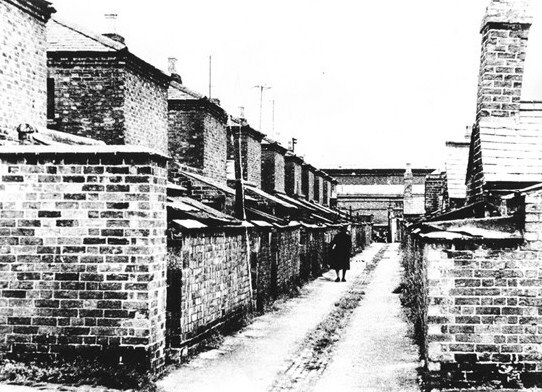 This photo, taken in the 1960s before demolition, is the back alley of Ledsam Street and Young Street, looking north towards Church Street. My Dad used to live at number one Young Street when he was young. He lived there with his Mum, Dad and three sisters and a brother so it must have been pretty crowded.as I think he used to tell me there was only three bedrooms. He worked in the Works for a time and then went to Night School at the Science and Art and became a college lecturer at Wolverton College of Further Education which has since disappeared and there are houses built there now, it used to be on The Stratford Road. I can remember these houses very well and when they knocked them all down, one of my school friends used to live in Creed Street. My maternal grandparents family lived at 486 Ledsam Street. Family name of Massey and I have been researching the family tree in the area. My paternal grandmother Violet Alice Taylor lived at 478 Ledsam in 1901 according to the census, and later in 1911 at 17 Ledsam, with a family by the name of Green.